The first big phase is completed: the shell construction is up, the roof truss is on—and the enlargement of Messe München by two new halls and a conference area is halfway through. Today, Tuesday 20th June, the roofing ceremony took place. 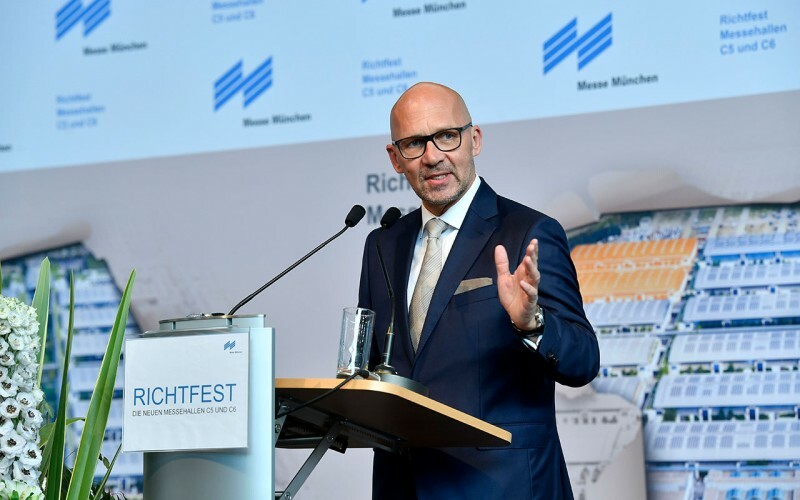 “We need these new buildings because the demand from our customers has been steadily increasing for years”, says Messe München CEO Klaus Dittrich. For IFAT 2018, the two new halls are to be ready. The cost: 105 million euros. For the roofing ceremony, cabaret artist Django Asül had some witty observations for the principal during his speech. 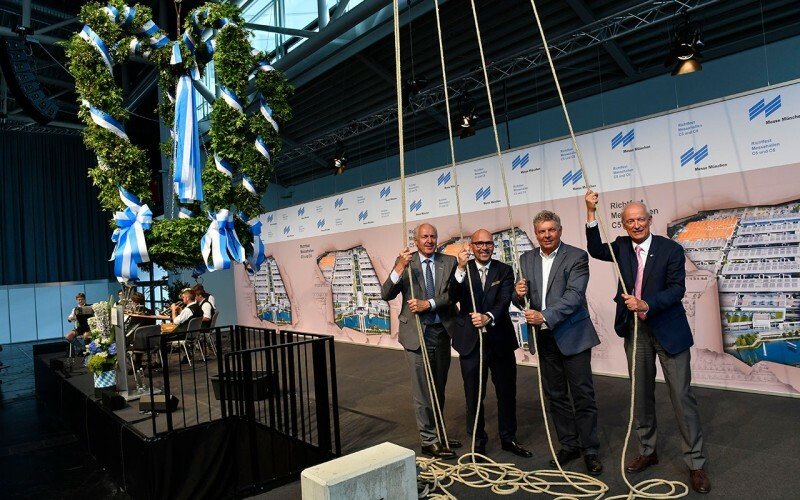 At the roofing ceremony, they all pulled together: Klaus Dittrich and the representatives of Messe München’s four shareholders—the City of Munich, the Free State of Bavaria, the Chamber of Industry and Commerce and the Chamber of Crafts for Munich and Upper Bavaria—together hoisted the topping-out wreath. Before that, cabaret artist Django Asül had provided amusement. At a roofing ceremony, a sharp tongue is simply indispensable. The costs of around 105 million euros are financed by Messe München on its own without subsidies from the shareholders. The new halls have long been needed: all of the halls are already booked out now for four world-leading fairs—bauma, BAU, IFAT and ISPO. “Despite the internet, demand is increasing”, reports Klaus Dittrich. “From abroad too, the number of exhibitors and visitors coming to us in Munich is continually rising.” On moving to the new grounds in Riem, Munich in 1998, Messe München started off with twelve halls; at the time, 18 were already planned for the completed exhibition center. Since then, the company has experienced sustained growth. Today Munich is one of the most successful exhibition venues in the world. Messe München CEO Klaus Dittrich welcomes the many invited guests at the roofing ceremony for Halls C5 and C6 and thanks the building firms together with their workers and bosses. 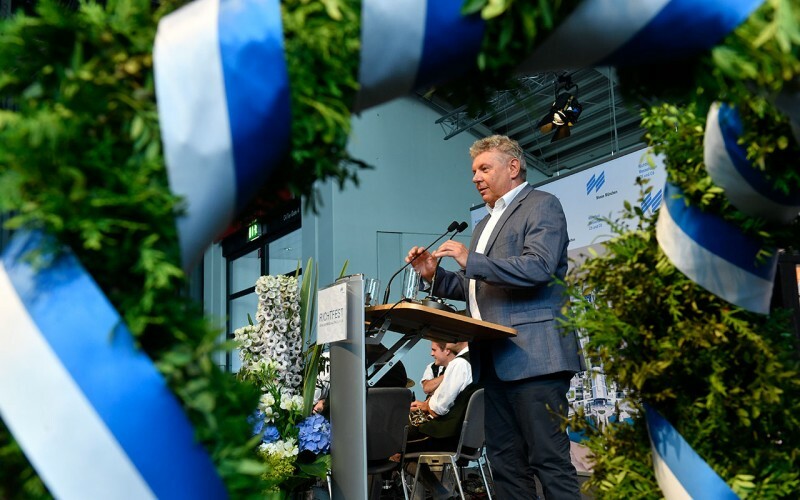 At the roofing ceremony Dieter Reiter, Mayor of Munich and Chairman of the Supervisory Board, is pleased about the success of the exhibition center: “Messe München helps the entire region to prosper”. Messe München and its shareholders pull together at the roofing ceremony too: (l. to r.) Franz Xaver Peteranderl, President, Chamber of Crafts for Munich and Upper Bavaria; Klaus Dittrich, CEO, Messe München; Dieter Reiter, Mayor of Munich; and Peter Driessen, Chief Manager, Chamber of Industry and Commerce for Munich and Upper Bavaria.